How much to raze the Siepmann Home? 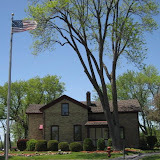 A thought came to me yesterday (Wed. May 20th) about the Siepmann farm house. The developer offered the home to the Elmbrook Historical Society along with $10,000. But how much would it cost the developer to raze the building and dispose of it themselves? Anybody have an idea? I am thinking giving the building and $10,000 is a bargain for the developer? Just for comparison, fourteen years ago, we remodeled. I think we saved about $3,000 in dumpster and some demo fees by hauling our debris ourselves--and that was just from part of a house. The farm house no doubt has lead paint on its walls. Does that mean another disposal fee? I stopped at Stonewood Village Wednesday to see the home in question and took some pictures. (Get while the getting is good, I always say.) I have heard the home has been butchered over the years and its interior is no longer in pristine condition. Stonewood Village was pretty empty when I visited in the afternoon --maybe 8 cars in the east parking lot including me? The west parking lot looked very empty too. The developer is hoping to turn this around by transforming the Village into the Wedding Center. I hope he is successful. The home in question is on private property and the owner is the one in charge of such decisions as long as zoning does not need to be changed etc. The Common Council voted to table the issue until June 2nd. I am always sad to see interesting older buildings go, but that is progress, I guess. It could be worse; the developer could be trying to put in high density apartments! I will have to take comfort in that. But is there a way to keep the home AND add the connector road in front of the farmhouse? If there is, maybe this is where the Common Council could grant a variance? As I stated in the comment section on Brookfieldnow, it is ironic that the very structure that inspired Stonewood Village is now the one set for demolition. The developer plans to raze a historic two-story barn to accommodate the changes, but representatives from Stonewood Village [said] they would be willing to work with the Elmbrook Historical Society to relocate the farm or reuse some of the materials elsewhere on the site. The proposal for the first phase now goes to the Common Council for approval Tuesday, May 19. Subsequent phases of the project will need the approval of the Plan Commission and the Common Council. This has been in the works for some time. On Jan. 12th, Brookfield's Plan Commission "heard a proposal from Losik Engineering and Design Group to add a building at the site, as well as making parking improvements and landscape changes." I did not realize their plans involved razing a building until last week. The Stonewood Village Wedding Center seemed like a good fit for the collection of shops. I can see how brides to be would enjoy shopping and planning their special day in such a quaint setting. The idea of adding a reception/banquet hall is appealing too. If they haven't proposed this yet, I could see them adding some sort of chapel for the actual wedding service. It saddens me, however, that this charming wedding wonderland would come at the expense of losing yet another historic building in Brookfield. Unfortunately, the building in question is brick; it cannot be moved easily. An acquaintance on the Elmbrook Historical Society informed me that the Siepmann family was just as prominent as the Ruby family in early Brookfield history. I just returned from a trip to Henry Ford's Greenfield Village in Dearborn, Michigan. Greenfield Village is a collection of historic homes and buildings from all over the country that Henry Ford began moving to Dearborn in the 1920s. Ford had the foresight to preserve these structures so future generations could enjoy Thomas Edison's workshop, the Wright Brother's bike shop and family home, the Heinz home (pictured), Webster's home, etc. Granted, the Siepmann's are not as famous as The Wright Brothers, but can't we find some way to save the Siepmann farmstead and still do the wedding center? *The article said the building was a 2 story barn; my EHS acquaintance referred to it as a home. I have been making these oatmeal muffins ever since the oat bran craze came on the scene--maybe 15 years or more ago? I call my recipe, Too Good to be Good for You Muffins. They are fat free, egg free, and can be dairy free too, but you can add in some oil and use eggs if you like. You will need to reduce the liquid by 2 Tablespoons for each egg used. I use egg replacer powder by Ener-G. I purchase mine from Health Hut. Probably Outpost would have it too. Do not confuse this with egg beaters or similar egg based products. This does not contain ANY animal products. It works very well, and since it is a powder, I don't have to worry about needing eggs to bake with. You can reduce the honey if you want a healthier version, but I use the 1 1/2 cups of honey to make my Honey happy. Too Good to be Good for You Muffins: Yield, 4 dozen. No mixer needed, just a very large mixing bowl. 1 Cup of wheat bran. Lately, I have not used wheat bran but just add another cup of oatmeal. OPTIONAL: 1 1/3 Cups of the following: Chocolate chips, raisins, and/or chopped pecans, walnuts, or roasted unsalted sunflower seeds. Spoon into Pam sprayed muffin pans* and bake for 20 minutes or until a toothpick comes out clean. Let cool and gently remove from pans. Mini muffin pans work too, but baking time will be shorter. Store in Tupperware like containers. The muffins freeze well. I make these about every 3 weeks. I hope you will give these a try. Most people like them. No, they are not chocolate cake, but I think they are good for breakfast or snacking. Let me know what you think. *Aluminum pans bake the best. You can use muffin paper liners too, but I prefer PAM. My mom was an amazing woman. Her priorities were God, Dad, us, others, then herself. She was kind, generous, and a whiz at managing money. Since the economy is in the news so much these days, I will focus on her money management talents. To use an expression I once heard, she could pinch a nickel so hard the Indian was riding the buffalo! That is no longer politically correct, but thankfully, the nickels have changed now too. We can still use the expression. The updated version would be she pinched a nickel so hard Jefferson was riding the buffalo! I am sure if she had been sent to Washington, she could have balanced the budget. Her philosophy of money management was to skimp on things that don't matter so you could splurge once in a while on something that would greatly improve your quality of life. That is how we ended up with a dishwasher back in the 1950s and a color TV in the mid 1960s. You may snicker at those two items being a luxury, but trust me, they were not the norm--even in Shorewood. One of the items we saved money on were clothes. Mom sewed her clothes and most of my sister's and mine. She taught me to sew and I made my first dress in 3rd grade. Another other area of savings were vacations. I think we started camping in 1958. Even though mom was not really the camping type, she saw that it was a relatively inexpensive way to see the U.S.A. We would pack up our huge cabin tent and head out to Mt.Rushmore, the Badlands, Yellowstone, Glacier National Park, etc. Those are fond memories. I had some girlfriends who were from much wealthier families than mine. There wasn't jealousy or envy about that fact; that was just how life was. One in particular has been my friend since the 1st grade. Her parents owned a popular resort up north that was frequented by Green Bay Packers and other local celebrities. She spent each summer up there. Her mom took her to Chicago each year to purchase all new school clothes. Because I was always interested in fashion, that was a wondrous thing to me. They also had a housekeeper who did all of their cooking. My friend seemed to have the ideal life at the time. Recently my 1st grade friend mentioned how she thought I was the privileged one when we were growing up. She wished her mom sewed her clothes, made oatmeal cookies, and above all, she wished she could have traveled like we did on our camping trips! In looking back at my life, I have to agree. I was privileged. I still am. So much of who I am and what I value was influenced by my Godly mother. If she were here today, I would rise up and call her blessed. She left a pair of large shoes to fill. If your mom is still here, be sure to tell her all that is in your heart this Mother's Day. Senator Jim Sullivan's Town Hall....GRILLING! OUCH! Curiosity won out last night, and so I went to Brookfield East's library for Sen. Jim Sullivan's Town Hall meeting. I didn't know what to expect; I have never been to one of his meetings. Would I be the lone conservative amongst liberals? I had recently attended Rep. Jim Sensenbrenner and State Rep. Leah Vukmir's Town Hall at the Wauwatosa Library. It attracted about 100 attendees--nearly all were supportive of their positions on the issues. Introduction: Sen. Sullivan began by giving an overview of what would likely happen in Madison this year. He used our info sheets to target issues that were important to us. Sullivan spoke in very vague terms as if he had nothing to do with any of it. By this time, a few stragglers came in. I think at max. we had 7 attendees in all. Voter ID: Sullivan talked about how he was the Co-sponsor of Voter ID legislation last year because he was opposed to amending the constitution for that purpose. Of course, his vote against putting the Voter ID constitutional amendment question on the ballot last year killed any chance of Wisconsin voters weighing in on the issue. (Voter ID is supported by a vast majority of Democrats and Republicans.) I did clarify that a constitutional amendment could not be vetoed by the governor, but legislation could. I think Jim was hoping to slip out of that one! Health Care Transparency: Evidentially, Sullivan did introduce health care transparency legislation last session too, but was quick to point out that it did not move forward. He mentioned something about when a measure is perceived to be a Republican issue; it won't get support, even if it is a good idea. I took it that Republicans would not approve of a Democrat sponsorship of one of their issues? But it was fellow Dem. Erpenbach who foiled Sullivan's attempt to put this forward. It did not make it out of committee. Sullivan did say he would reintroduce it after the budget is settled. Abortion: Then the abortion question came up. Sullivan said he did not think there would be any new legislation regarding abortion this year, again acting like he was a bystander. I suggested that he inform us of what HIS position was on these issues, not just that he did not think any abortion legislation would be passed this year. I then brought up the fact that Sullivan cast one of the 2 deciding votes to confirm 2 pro 2nd trimester abortion board members, Roger Axtell and Michael Weiden, to the University of Wisconsin Hospitals and Clinics Authority Board last month. I added, I did not like my tax dollars going for abortion. Sullivan fired back that the clinic wasn't tax supplied. Another woman piped up that wasn't true; the board itself admitted they did receive tax money. Sullivan tried to quiet her by saying she was interrupting me. I quickly said I yielded the floor to her! Turns out, I think we were all pro-life and rather upset by his vote. After some back and forth, Sullivan finally admitted, "I am absolutely in favor of late term abortion" and "I would do [vote for] it again." No wiggling out of that one! RTA: Next topic was the RTA. Sullivan said the joint finance committee vote was a mess--a political compromise to protect Lehman from casting a vote in favor of a sales tax. Sullivan said he would vote for a dedicated fund, the 1/2% sales tax on 3 counties, but not the measure for a Milwaukee 1% sales tax. That is when a 30-something self described unemployed Christian conservative spoke up. He was adamantly against the RTA with its appointed board. He strongly objected to the whole concept of the RTA (as we all did) and even more to the idea of an appointed board. Appointed boards have NO accountability. Sullivan tried to say that he is only for the Governor's original plan, but this group was well informed. They brought up that Doyle's plan had an appointed board too. Sullivan committed to a NO vote on the present Milw. 1% tax and YES for the RTA, if it had a 1/2% 3 county dedicated RTA tax. The fact that the RTA was not self supporting didn't faze Sullivan at all. He fired back that no transportation is self supporting, citing roads as one example. Roads receive gas tax funds, he said. I thought that a poor example since those that use the roads, pay the gas taxes to fund the roads. I brought up the fact that public transport, such as metro rail and busses, must run the trains at all times regardless of rider-ship. We just returned from St. Louis where their metro was very lightly used. Maybe 6 people on the whole train--some cars empty? That is expensive transportation. Whereas every auto on the road has at least 1 rider, the driver! Sullivan was very defensive after a flurry of other negative comments on public transportation. "Not everyone drives cars" he said defensively. The RTA is busses, shuttles, and trains; this will save us money. The very informed woman said, how much will it save? Have a referendum! Sullivan did admit that the vote was close. It was also only in Milwaukee--not in his Waukesha district area. We tried to discuss the RTA further, since it is such a good example of unnecessary spending and more bureaucracy, but he would not allow it. $6.5 Billion deficit: An older gentleman brought up the staggering $6.5 billion debt. "Where are we going with this?" Sullivan touted the 1% across the board cuts and the 209 State jobs eliminated. The informed lady asked, were those real job cuts or just attrition? Sullivan then said since 2003, I believe, 4,500 positions have been cut from the total state roster. But out of how many jobs total? someone asked. Hmm, that information was not known. The group then muttered about how many private sector jobs have been lost. The Senator was looking a bit red faced at times. He was definitely in the hot seat! Joint Several Liability Rule Reform: The older gentleman urged, "Let's hold on to the spending." Then he brought up the 1% liability. The Joint Several Liability Rule Reform, which Sullivan supports. Some view this as just being a sop to trial lawyers. It would make someone with just 1% liability be responsible for the entire award to the injured party (thus the lawyer gets to collect his fee.) None of our surrounding states have it--they all changed it years ago--the gentleman stated. Sullivan tried to chalk it up to just going back to what was in place before. The smart lady said something like how far back are we going? Why not cite a pre Civil War law! Fund raiding to balance budget: The subject of raiding transportation and physicians' liability funding to balance the budget came up. Finally, some breathing room for Jim Sullivan, he said he was against that. Stimulus spending: The Zoo I-94 interchange subject was addressed in relation to shovel ready stimulus projects. Unfortunately, it was lacking about $20 million in planning yet, so the $1 billion dollar project cannot be a stimulus project. Sullivan is trying to protect the $20 million for planning in the current budget. Sullivan is pro UW center being built at the County Grounds and also pro Veteran's benefits. He will be voting on the whole budget with these issues in mind. The Senator brought up the privatizing of infrastructure and services. Recently, the leasing of Milwaukee's water system came up. He saw getting the water off our tax bills as beneficial in the short term, but was wary of the long term ramifications. Privatizing: The 30-something gentleman thought the water issue was a good example of what government should be involved in. That they should ask the question, "Are these [budget items] vital, are these necessary? Like the water question, is the RTA vital?" Based on the comments from the evening, Sullivan was the only one who thought so. Litmus test for spending: Good litmus test though for spending, "Is it vital?" We all agreed we were making cuts in our personal spending and we expect our government to do the same. The 30-something man chided, "You are in a bubble in Madison." Sullivan tried to deny that by saying he does not live there. I think that rational fell flat, at least on this group. My impression was that Jim Sullivan likes to pass himself off as a moderate and doesn't want to acknowledge any culpability in what is going on in Madison. Senator Jim Sullivan was invited to join US Congressman Jim Sensenbrenner and State Rep. Leah Vukmir for their Town Halls, but he did not participate. Their Town Halls were held on several weekends when working people could attend. Jim Sullivan has 2 per year: spring and fall. This one was at 5:30 on a weekday, making it difficult for working people to attend. The word arrogance came up more than once to describe his attitude. It isn't the first time I have heard someone describe his attitude toward a constituent's opinion that way. I have to agree. It is pretty difficult to deal with someone who won't even acknowledge his responsibility in promoting 2nd trimester abortion by appointing 2 very pro abortion board members to the UW Clinic board. Saying that a member's stance on abortion should not be a litmus test for board approval seems a strong disconnect. He maybe able to quell his Catholic conscience that way, but he is not convincing me he is blameless. I am glad I attended. The meeting certainly confirmed my opinions of Senator Jim Sullivan. I sure hope there is a good, strong conservative Republican planning a run for Senate District #5 in 2012. Since Waukesha County residents didn't have any type of referendum question on the RTA, perhaps you would like to share your thoughts on the RTA as well as other issues with our Senator? I just got a robo call from some young lady telling me of a State Senator Jim Sullivan Town Hall meeting tomorrow at Brookfield East High School's library at 5:30 PM. Can't say if I will attend on such short notice, but I thought at least I would pass it on to you. If I did go, I might want to ask him why he voted to confirm Roger Axtell and Michael Weiden to the University of Wisconsin Hospitals and Clinics Authority Board last month. If you have not been following this issue, the University of Wisconsin Hospital and Clincs will be performing 2nd trimester abortions at the Madison Surgery Center. That means Wisconsin taxpayer money is going to go for aborting viable children. The children are so developed, they must first be dismembered in the womb. Outside the Senate chamber just prior to the vote, Pro-Life Wisconsin and other pro-life organizations and advocates spoke at a press conference called by Senators Glenn Grothman (R-West Bend) and Mary Lazich (R-New Berlin). Members of the pro-life medical community, including Dr. Bill Evans of Madison and Dr. Christine Zainer of Milwaukee, and parents of developmentally disabled children came forward to challenge the Senate to recognize the inherent dignity of all human persons. Pro-Life Wisconsin applauds Senator Grothman and his Republican colleagues for voting for life. We are especially proud of Senator Vinehout for voting her convictions with courage, in stark contrast to her Democrat colleagues who apparently could not bring themselves to oppose even late-term abortions. Pro-Life Wisconsin is especially disappointed in Senator Jim Sullivan (D-Wauwatosa) who in defiance of his professed Catholic faith voted to confirm Axtell and Weiden. I still remember former Mayor Kate Bloomberg's endorsement of Democrat Jim Sullivan over Republican Tom Reynolds. But the Brookfieldnow posting cited that in Bloomberg and Urban’s opinion, the Democrat they are endorsing is running to serve and represent the people of the 5th district effectively, “whether they are conservative, liberal, or somewhere in between”. Think about that. How is that even possible? On every major issue, I disagree STRONGLY with that candidate’s position. How is it I would be satisfied with his representing me? How could a pro-life, pro-traditional marriage, believer in lower taxes, (how could I forget pro voter photo ID, anti benefits to illegal aliens), fiscal conservative like me ever be represented by someone whose platform is pro-abortion, pro-gay marriage, opposed to voter photo ID, opposed to requiring welfare recipients to prove their legal US status, and pro-taxation? Any Republican espousing those liberal values would be an "embarrassment" to the Republican Party. But then, I asked myself, how well did Mayor Kate reflect my values? Not very well. So, why would I give any credence to her endorsement now? So far, Sen. Jim Sullivan has NOT represented me at all. If you cannot make the town hall, you might wish to contact him directly. This coming Thursday is the 58th annual National Day of Prayer in America. All across the country people of faith will be gathering around the flag poles at schools, city halls, and other public places to pray for our country and leaders. Some events are well organized; some are just a generic invitation to meet at your city hall flag pole from 12:20 to 12:40 pm. [The] theme for this year's event is Prayer...America's Hope! It is based on Psalm 33:22, which says, "'May Your unfailing love rest upon us, O Lord, even as we put our hope in You." This is an extremely critical time in America's history. From economic pressures, to the ongoing threat of terrorism, to the unraveling of our culture's moral fabric, many people are dealing with a deep sense of uncertainty and apprehension. I have attended 2 of these at Brookfield's City Hall Plaza* and found them to be an encouraging experience. Hope you will venture out and join me in praying for our country. If you do not feel comfortable praying corporately, please do not let that stop you from participating. If you are a person of faith, I think you will be uplifted whether you pray aloud or silently for our nation and leaders. This is not a denominational event, just a meeting of people of faith who care about our country. 2 Chronicles 7:14 tells us, "If my people, which are called by my name, shall humble themselves, and pray, and seek my face, and turn from their wicked ways; then will I hear from heaven, and will forgive their sin, and will heal their land." The Alliance Defense Fund is fighting this suit. They have a petition drive on their webpage Save the National Day of Prayer where you can contact President Obama: Sign the petition for President Obama They just announced, "The Obama administration announced that the president will sign a proclamation for the National Day of Prayer on Thursday." I hope I see you at City Hall Plaza. *Note: Meeting at City Hall Plaza is NOT a City of Brookfield activity. It is just citizens exercising their right to free speech in a public place. Much ado about swine flu: If it's serious, why no quarantine? First, I better state my disclaimer: I am not a doctor, nor do I play one on TV. I have not had any medical training outside of a college class in nutrition, physiology and anatomy, and genetics. However, sometimes I am dubbed Dr. Quinn or Dr. Spock by friends and family. I have been interested in natural medicine pretty much all of my adult life. Sunday's big Elmbrook news was that Tonawanda Elementary School will be closed for the week because of a confirmed case of swine flu*. That sounds serious. But is it? CDC acting director Richard Besser said there were "encouraging signs" the new strain was not more severe than what would be seen during normal seasonal flu. So CDC's director says the swine flu is pretty much like the normal flu we experience every year. This is not the BIG ONE like the flu pandemic of 1918. But if it was, would simply closing schools have prevented its spread and death? What will Tonawanda students do this week while not in school? Concerned parents might keep their kids at home, but probably most kids will view this as another week of vacation and play! Working parents must find day care for their children--so much for keeping the germs at bay. In Milwaukee, the middle school and high school students will no doubt hang out at the malls and movie theaters. Again, so much for reducing exposure to the flu bug. Do we as a society even understand the concept of keeping our germs to ourselves anymore? It does not seem so. Many businesses no longer give workers designated sick days; instead they have Personal Time Off--PTO days--days off given for any reason. But no one wants to give up a potential vacation day when they are sick. Consequently, they come to work when they should be home convalescing and share their germs with coworkers. The idea of a quarantine is long gone too. Yesterday, my neighbor and I were talking about the current swine flu hype and reminisced about the polio quarantine in the early 1950s. She and I both remembered that summer in the 1950s when we could not leave our yards. No playing with the neighbor kids. No going to the school playground. We were grounded--quarantined--for what seemed to be an eternity. Polio was a real threat back then; there was and still is no cure. Some schools might be closed this week. Thankfully, this time I don't think it really matters what the kids do on their time off--it's just the flu. I do hope we get our act together though. One of these times, the warning won't just be hype; it will be real. *With today's Nanny State mentality, I suppose it was too much to hope that parents would be the ones to decide if their child should attend school or not. It seems it was the Waukesha County Health Department's call to close the school. Dr. Gibson did request that students avoid contact with each other for the week. I am glad Jim Ott's Reports are now online, because I did not subscribe until about Report #4. Now I can catch up on the ones I missed. So far, there have been 10 reports on the subject of global warming/climate change and how Wisconsinites will be affected by Governor Doyle's Global Warming Task Force and proposed legislation to reduce greenhouse gasses. This week's report, What's Wrong With Nuclear Energy?, deals with the question, if CO2 is now considered a greenhouse gas--a pollutant--why aren't we looking to nuclear power to meet our energy needs? By not encouraging the expansion of nuclear energy, Governor Doyle Task Force is saying that an industry with an excellent safety record in the U.S. is more dangerous than increasing levels of carbon dioxide. If that is true, then the dangers of carbon dioxide must be highly exaggerated. Good question. Calling CO2 a pollutant is ridiculous in my opinion. Carbon dioxide is a normal result of human and animal respiration and combustion, and it is a necessary compound for plant respiration and photosynthesis. Carbon is an element found in all living things. What is next? Naming Dihydrogen Monoxide as a toxin? If the name Jim Ott is familiar to you, it is because he served as WTMJ's Meteorologist for many years in the Milwaukee viewing area before running for the 23rd State Assembly. His approach in his reports is very professional and logical, unlike some of the emotional appeals the doom and gloom global warming activists produce. Next week's report will deal with "some revealing quotes about global warming." House Republicans have been doing a good job of presenting a united front of voting NO on the stimulus spending and bailouts since Obama became president. The media and Democrats have dubbed them the Party of NO. I prefer to think of them as the Party of KNOW. When you know what these irresponsible spending bills and what the burden of adding over $9 trillion in new debt over the next 10 years will do will do to our economy and our children's future, how can you vote any other way than no? Some conservative Democrats, the Blue Dogs, have joined those voting NO on occasion. Yesterday marks the first time the Senate Republicans were joined by enough Democrats to defeat one of President Obama's "housing priorities." Dare I hope this is a new trend for the next 100 days--that reality is finally settling in? That more of our representatives realize it is time to leave the euphoria of Obama's inauguration behind and settle into the reality of what they are doing? The power of a united minority was on beneficial display yesterday, as Senate Republicans defeated the budget bankruptcy "cramdown" bill. Credit goes to Arizona's Jon Kyl and Minority Leader Mitch McConnell, who kept their party together to beat destructive legislation that had easily passed the House and was one of President Obama's housing priorities. The cramdown would have allowed bankruptcy judges to rewrite contracts to reduce the amount that people owe on their mortgages. But a bipartisan majority understood that relief for today's troubled borrowers would be paid with higher rates on the next generation of homeowners, as lenders priced the added risk into mortgage contracts. A dozen Democrats joined Republicans in the 51-45 vote, and even Pennsylvania turncoat Arlen Specter gave his former GOP comrades an assist. Speaking for millions of renters and nondelinquent borrowers, Mr. McConnell said that the vote "ensures that homeowners who pay their bills and follow the rules won't see an interest-rate hike at the whim of a bankruptcy judge." I am hoping this "first major legislative setback" will be the first of many more legislative setbacks. After all, there is still health care and cap and trade to be worked out. A girl can hope.